There are many different ways to watch the CPBL games during the season, either via the traditional TV broadcast or through various online streaming services. On March 7, 2019, the CPBL has announced a partnership with Yahoo Taiwan to provide free online streaming service to all CPBL games for 2019 season. Notes: Depending on which team’s home game, some team will have a region lock on their stream. In that case, overseas fans would have to use CPBL TV or bypass it with VPN. 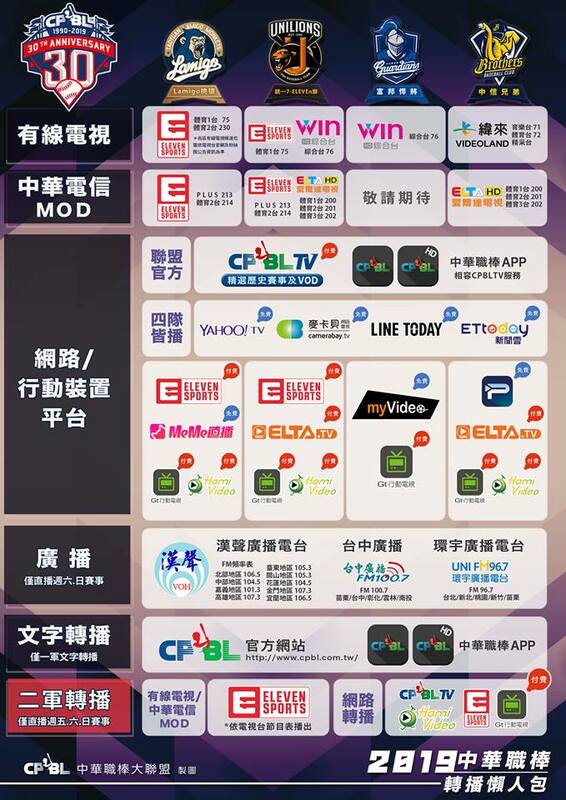 For those of you living in Taiwan, you can refer to this handy chart for 20 or so different methods to watch the CPBL games. Just like MLB TV, there is a CPBL equivalent called CPBL TV. It cost roughly $35 USD a year, and provide live streaming and video-on-demand service. Alternatively, you can choose to watch it on other free platforms which we mentioned above. ELTA Sports also put the full game highlights (3 to 10 minutes condensed game) on their YouTube channel. However, due to the licensing agreement, it is only for the Uni-Lions and Brothers’ home games.